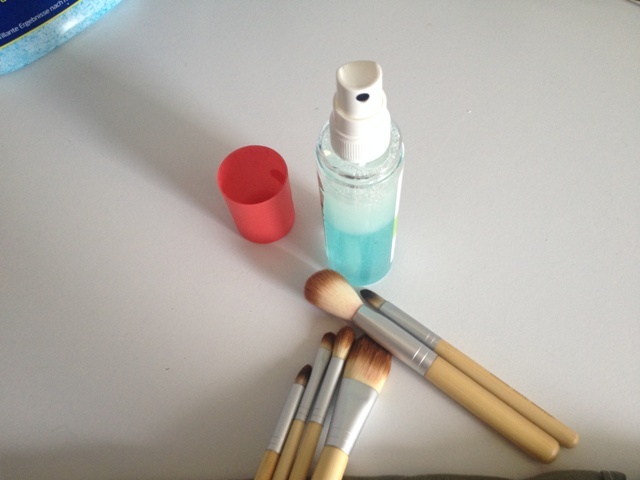 Make your best out of your make-up brushes with this homemade cleaner! Either if you’re a big make-up fan or an artist doing your own stage make-up, you’ll need some good quality make-up brushes. But once you’ve spent (sometimes a lot) of money on your tools, you want them to do their job for a long time – which means you have to take care of them well, too. And after some long googling hours I found this recipe and it works really well! Shake the bottle before using, then spray some of the cleaner in the palm of your hand and wash your brush in circular motions, so the color/make-up comes out. Rinse with warm (not hot!) water and make the paper towel test, if some color still comes out on the paper towel repeat the washing. Otherwise blot excess water with paper towel and hang your brush to dry with the bristles facing down. This is very important: you don’t want to dry them upwards, for water would get into your brushes and loosen the glue that holds the bristles together causing them to fall off. I found clothespins to fit most of my brushes perfectly and with a bit of juggling, my brushes will hang on the edge of a shelf in the bathroom, waiting to dry and be ready to go again.